This whole Lucic thing from the other night is killin’ me. I follow hockey and am a huge Bruins fan, but basketball is definitely my “go-to” winter sport. So stop me if I’m wrong, but don’t hockey players pride themselves in how much tougher they are than any other athlete? Although not how I’d state it, I definitely do respect hockey players for that aspect of the game. 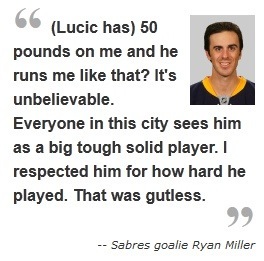 That being said, how can Ryan Miller come out and complain about a hit that resulted in a minor penalty. Did he think he could come about 20 feet out of the net to try and stop a Lucic breakaway without suffering the consequences? I love the mentality of playing tough and physical in any sport if you want to win. Since Miller came well out of his crease to play the puck like a defender, he’s going to get treated like a defender, especially with the Looch coming at you. Anyways, Lucic has a hearing with the NHL today at 1pm to determine if they’ll be any consequences for the hit. With the NFL implementing all these new hitting rules, I’ll be disappointed in the NHL as well if they make a big deal out of this. Never more fitting than in this situation…It’s just part of the game. NO EASY BUCKETS! This entry was posted in Bruins and tagged boston, bruins, fight, looch crew, lucic, miller, sabres, sports by jtulz07. Bookmark the permalink.